We’ve heard and read about people whose hatred for their enemies had caused them years of bitterness and a mental state of revenge. Here is a story of two mortal enemies who found forgiveness and friendship in Christ. Kumander Revo was known as one of the notorious leaders of the New People’s Army (NPA)* at Columbio, Sultan Kudarat in the Philippines. At a very young age, Revo joined the group because he felt that the government is very unfair and he wanted to change some of the laws in favor of the ‘masa’ (common people). Though quite young to lead, because of his many skills and abilities, young Revo became Kumander Revo of the New People’s Army. 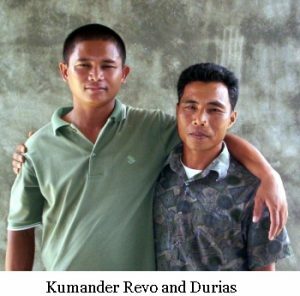 For thirteen years, Kumander Revo lived in the jungles with his NPA group – and was considered a feared enemy of the government. During his leadership, his group abducted Rosete, an Adventist church elder of Caloocan, Koronadal City. Rosete, an agent of the Philippine Marine Task Force, was assigned to meet the five Kumanders of the New People’s Army to negotiate with them. Prior to their meeting, Rosete envisioned a successful negotiation. Unfortunately, instead of negotiating, the 5 Kumanders decided to hold Rosete captive. Negotiations by the government with the NPAs for the release of Rosete were unsuccessful. The rebels found out that Rosete was quite useful to them and asked him to join their group. But Rosete stood by his principles and rejected the rebels’ offer. Though tortured constantly, Rosete did not give in to their demands. He was held captive for five years. Later, he was killed. But he remained a faithful follower of Christ. His remains were returned to his family in 2005. After this incident, Kumander Revo and his group struck again! They attacked one of the posts of the Philippine Army in Columbio while two of the guards were sound asleep, and the third guard was out buying food. All the weapons and equipment’s inside the Army Headquarter were taken by the rebel group. Due to his negligence, Officer Durias, the guard who left to buy food was fired. He lost his good-paying job. His family suffered greatly from his financial loss. And in his anger, Durias planned to hunt down Kumander Revo to kill him. A few years passed but Durias did not find the elusive Kumander Revo. Still, hatred and bitterness filled his heart for his enemy. Last October 3, 2006, Pastor Elmer Rom ano, adopted minister of Southern Mindanao Mission was assigned in Columbio. Knowing that the place was considered dangerous, Pastor Elmer did a thorough survey of the place in preparation for a Bible and Family Life Seminar there. The young minister made friends with the town people right away. Four adopted ministers (Pastors: Larry Lanistosa, Jezreel Abella, Andy Dagum & Joel Hubero) and some of the brethren joined Pastor Elmer and did the groundwork – giving Bible studies in homes. In the meantime, God was working behind the scenes – getting ready to give everyone a great surprise. The adopted ministers happened to visit the home of former Marine Officer, Durias and his family who gladly accepted the Bible studies and later attended the Family Life Seminar. The Holy Spirit touched their hearts and they accepted Jesus Christ and planned for baptism. Meanwhile, when the adopted ministers expanded their area of home visitations, they entered the home of Kumander Revo and his family. Revo gladly accepted to have Bible studies together with his family and also accepted Jesus Christ. So, their baptism was also set. The Family Life Seminar ended. Then they scheduled two days for baptizing. On the day of the first baptism, the river bank was packed with people. When the minister called for the baptismal candidates to line up, lo and behold, Kumander Revo and his family emerged from the crowd and joined the forming line. So did Durias and his family. Seconds later, Durias saw Revo. Startled, he wondered, “What’s he doing here? Could he possibly be getting baptized also? Praise God!” Kumander Revo glanced at Durias and nodded. It was their first time to see each other because they attended different Family seminars. Amazingly, the deep hatred that once was in Durias’ heart was no longer there. Instead, brotherly love and compassion, which only Jesus could bring, filled his heart. Revo likewise had nothing except love and friendship for Durias. What a beautiful sight- two families unite in love. They shook hands and were baptized last March 27, 2007. Today, they are both very active in the Seventh-Day Adventist Church together with their families. Revo is now the Sabbath School leader of New Bantangan, Columbio SDA Church, while Boy Durias is the church elder of a church under construction at Columbio proper. Surely, God is rejoicing for these two families who were reunited in His fold. * The New People’s Army (NPA) is a paramilitary group fighting for communist revolution in the Philippines.